This is one of those recipes I've been working on over, and over again, trying to get it to what I'd like. I am a huge key lime anything fan and I do miss those creamy pies, especially in the summer months. In order to help satisfy those cravings, I decided to create one of my own with a little research and trial and error. The biggest trick with this recipe is finding the best balance of clear gelatin to preferred firmness for the pie. Too little, and it's more like a pudding than a pie, too much and you have a more pumpkin pie like firmness. I also found that the sweetness came into play. I am not such a sugar fiend as I used to be and therefor don't add as much as I would have a few years back. That doesn't mean that more sugar can't be added. So bear with the little side notes on this recipe and take them all in before you try your hand at this. I finally found a balance I like, but you may need to adjust to get it to where you like it using the parameter of measurements I'm giving in this recipe. Anything more or less, just don't work. Also, I do get specific with brands in this for a very good reason. Not all canned coconut milks are created equally. I prefer two specific brands due to their reliable consistency. If you cannot get these two brands, then you may find you'll have to try this recipe out more than once for your preferred results. As for the gelatin, different brands have different amounts in their packets. Aggravating right? So definitely get the brand name given in this recipe. Sciency-recipe stuff aside, it is so good! I love the blend of the chocolate and key lime and it's a great treat to have after a nice grilled dinner. The crust crumbles a little as you serve it and becomes a great garnish to sprinkle on top of each slice. Add on a creamy topping and it's just what I hoped it would be! So without further delay, here's the nitty gritty of it! In medium bowl combine all ingredients. Then evenly press mix into pie dish greased with extra coconut oil. Bake at 350 for 10 minutes. Allow to cool completely. In a medium glass bowl, that is microwave safe, pour juice of limes and then carefully and evenly sprinkle packages of gelatin over the juice. Allow the gelatin to bloom. You know it's ready when it's absorbed the liquid and fluffed up a bit. Place bowl in microwave and heat at increments of 10 secs to melt the gelatin. You will know it's done when you do not feel the granules anymore. For room temp lime juice I only needed 30 seconds. It may be more if you used lime juice that is colder. Using a hand mixer, begin to gently whip the gelatin mix into a slight froth. About 30 seconds usually. Then add in sugar, the "cream fat" of the coconut milk, and the vanilla. Continue to whip the mixture until well blended and smooth. Fold in the zest. Allow mixture to sit for about 10 minutes to get the flavors to mix together. Pour mix into pie shell and chill until firm. Make sure to use either Golden Star or Thai Kitchen brands to really get a whipped cream texture. Other brands do not solidify as well so you will get something more like a cream sauce, like what is shown in the picture. That particular brand was called Geisha and I do not recommend it after having tried it out for this whipped cream recipe. It still works well with the pie in this form but you just don't get the extra creamy aspect and you have to drizzle over instead of a nice dollop. 1 can full fat coconut milk chilled and separated, reserve liquid but most likely will not be needed. 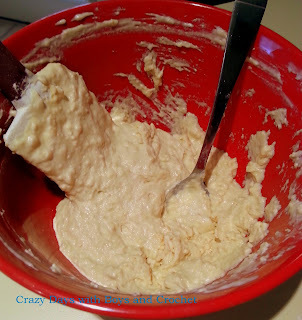 In large chilled glass bowl, add all contents and begin to whip with a hand mixer. Do not over do it or it will cause the mixture to become grainy. You can add a dollop on top of your slices of pie before serving. Dairy and Egg Free Waffles- A Family Hit That Isn't Just for Breakfast! The other night I asked those classic words most moms do when they've hit a cooking dinner wall, "What sounds good to you for dinner?" My mistake since my oldest excitedly asked for waffles. 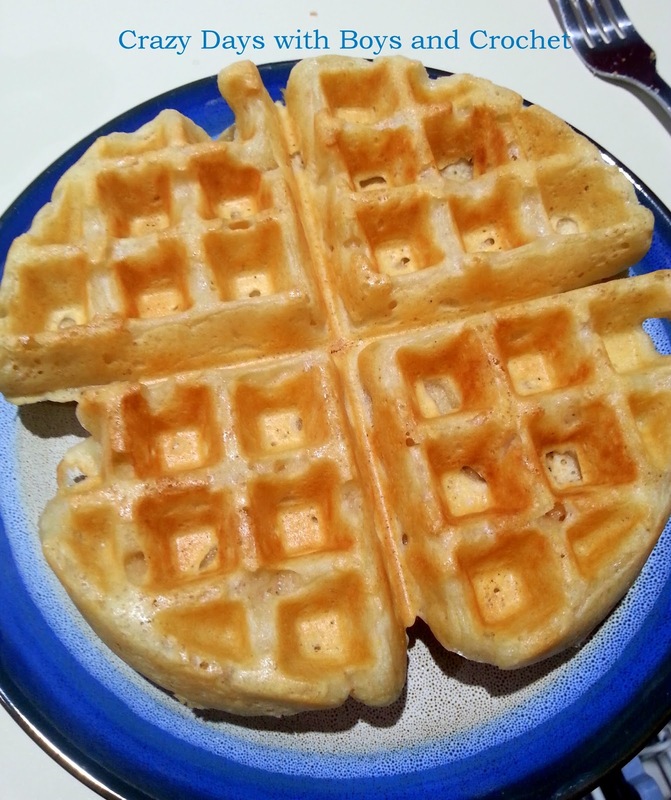 Granted, my husband got me an awesome waffle maker and we've enjoyed trying out new recipes, I had a hard time finding one where I could truly enjoy the end results because all those recipes called for eggs, which really are not a great food item for me. Really, they are on my "do not eat if you want to feel comfortable to do daily things" list. This evening proved a little problematic in the fact that not only did I really not want to make a dinner that didn't sit well for me, but we were out of eggs, so any of my recipes for our waffle maker were pretty much no goes. Helloooooo internet. After reading a few other recipes that were actually egg free, but very DAIRY friendly, I decided to try my hand at making my own recipe that was both dairy AND egg free. 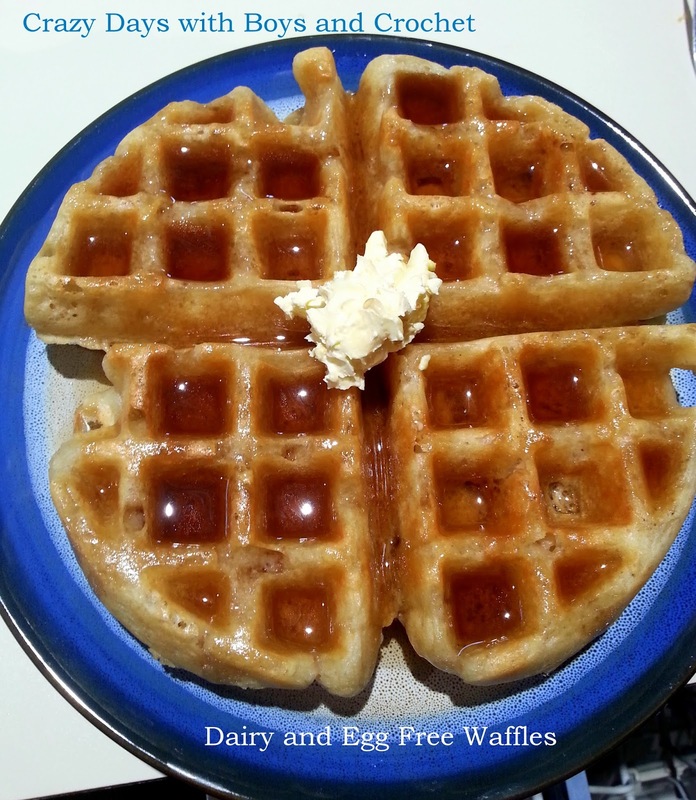 So, if you are also a no egg, no dairy type, give these a whirl! I haven't tried these out with a more gluten friendly flour, but you can certainly try. since batter will naturally be lumpy. 4. Give the batter about 5 minutes to set and expand. See pick below for target consistency. 5. When waffle maker is ready, spoon batter on and spread a little out before closing. Follow directions according to your making from this point. The past two winters have been terribly, awfully, dreadfully cold and peppered with some intense snow and ice storms. Unfortunately, a large holly bush that lived on the corner of the garden in front of our deck lost the good fight after these two harsh years. I decided it best to just start by cutting back its branches and getting rid of them before too many of the leaves withered off and turned into weapons of injury hidden in the grass. Trust me, those little points get razor sharp as they dry. I hacked away at this bush and its nightshade companion, another potential reason for its demise, and discovered a rather interesting shape underneath. It was one of those "hmmmmmm" moments where you start to wonder if maybe you could do something with what is in front of you. After bundling the branches and having them hauled off, I told my husband I wanted to leave what was left of the trunk. He had no complaints, since it meant he wouldn't need to remove yet another stump. A couple days later, a fun idea worked its way into my mind. I love it when gardens have a touch of whimsy in random little spots, and in this case, I had a brand spanking new area in my corner garden looking for whatever whimsy it could get. The trunk is a twisted and gnarled formation, and it reminded me of those many trees and posts you'd see in a fairy tale. 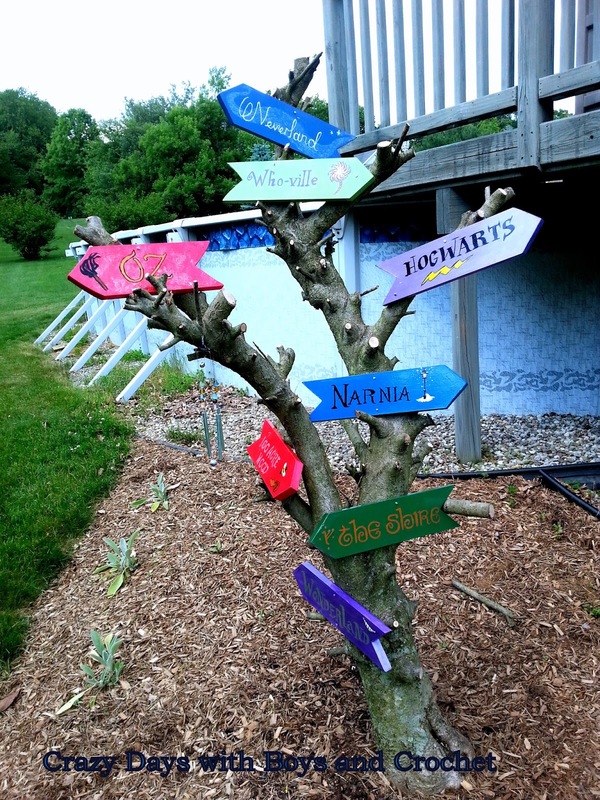 From there, I thought it would be fun to turn this trunk into a sign post showcasing lands from fairy tales. 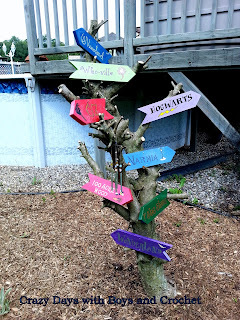 First, I needed to come up with some lands that would be familiar to our little family and any visitors who found their way to this part of my garden. 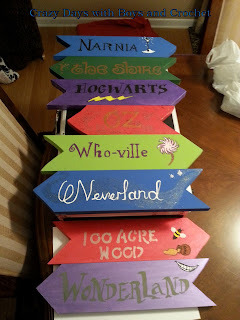 With the help of my husband and bookworm friends, we came up with a great list to get us started for this project. Once I explained my idea, my husband was totally on board and actually got the signs cut for me. After getting the signs sanded and ready, I began to paint them and then looked to the popular fonts used for the titles of these lands to add that touch of familiar to their appearance. To do this, I just did an image search using the title or name I needed. 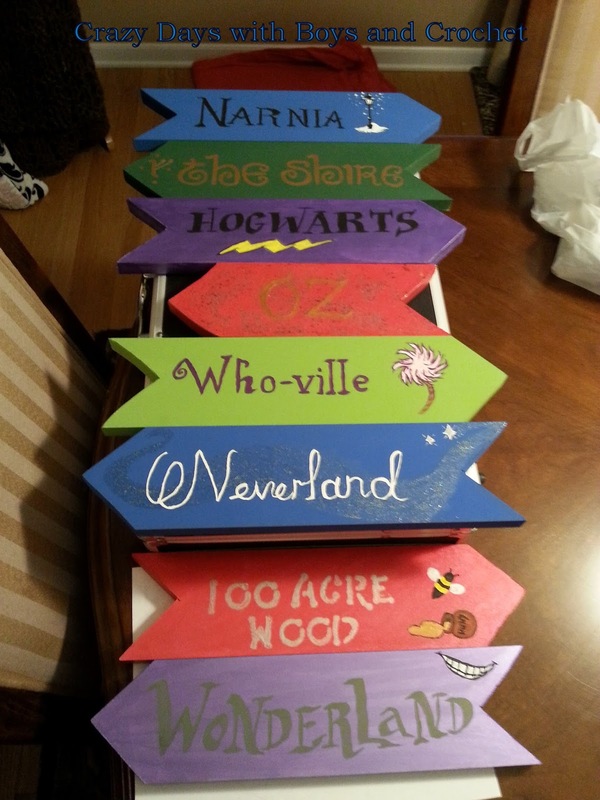 Once I found an image that worked for me, I just printed it out and then used it as a visual guide while I hand painted the names onto the signs. Along with the names, I decided to add iconic touches to give a nod to those literary works. Something as simple as Gandalf's mark added onto "The Shire" sign brought in that magical aspect to what would have been a little more basic. 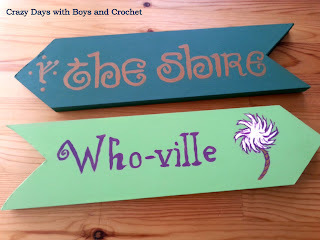 For "Who-ville" I used the flower that Horton carries around for the motif. This actually became one of the really fun parts, the whole figuring out what to do for each one. "Wonderland" was almost automatic. 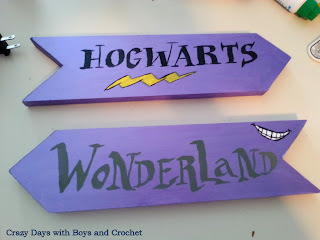 Who doesn't recall that large grin left behind by the Cheshire Cat during one of his conversations with Alice? Playing off the idea of things not always being what they seem in that land, I created a fun color for the lettering that almost fades in and out depending on how you look at the sign. Another big must do name was "Hogwarts" from Harry Potter. Of course a lightning bolt was a given. With there being so many iconic aspect to those stories, I went for the one that is practically ubiquitous to the series in its entirety. 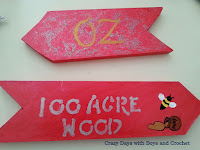 Turning again to more classic stories, I knew I wanted the "100 Acre Wood" from Winnie the Pooh. And a red background was a go to choice in connection to the red of the Pooh Bear shirt so many have grown to know, even though it technically isn't what Pooh Bear wears in his original form. To that sign I added a bumble bee and a honey pot, complete with the wrong way to spell "honey" as you can often see in the illustrations. Next up was the land of "Oz" which was honestly a bit more tricky. I went with the red background as well and tried to give it a sense of the ruby slippers, again another pop culture icon if not true to the original story. The glittery red background and golden lettering looked nice, but I realized after a bit, it came off rather flat. It wasn't until the very last minute I added in a witches broom and outlined the lettering with a thin black line to make the sign look a bit more pulled together. Obviously, the first shot has the before look to it and the second is the after. Finally, I got to work on my two favorite lands. First up "Neverland," and I knew immediately how that was going to be tackled. 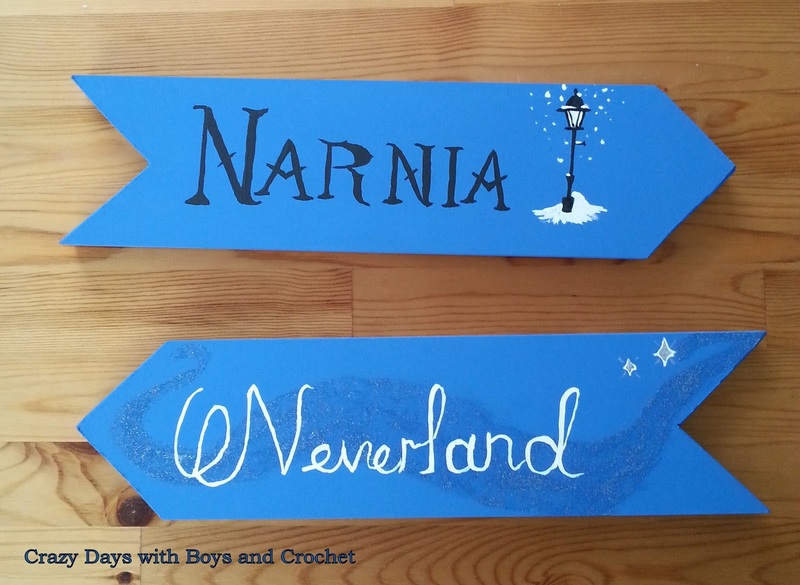 I painted it a rich blue and then used my glitter paint again, only this time to create a rolling path of pixie dust. To that, I added the swirly lettering as a nod to Disney's classic movie and painted the two stars at the other end of the pixie dust path..."second star to the right and straight on to morning" after all. 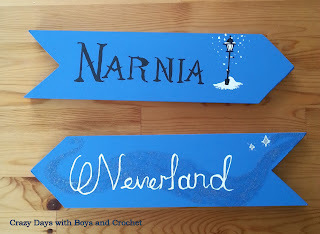 Lastly, "Narnia" was created using bold lettering and then I found myself musing on how to bring in those memories of mystery and magic. At first I thought of the scarf from Mr. Tumnus. But that is actually rather tricky to convey...then some snow flakes came to mind, but that didn't quite do it for me. As I mentally went through the story of The Lion, the Witch, and the Wardrobe, I remembered the lamppost! I knew that was it for me and added onto the sign. A few touches of falling snow and a drift at the base of the lamppost and I was thrilled with the end result. Even though I had the main part of painting done, I still needed to seal these since they were going outside. That took a bit more time since I needed clear sunny days for the best results. 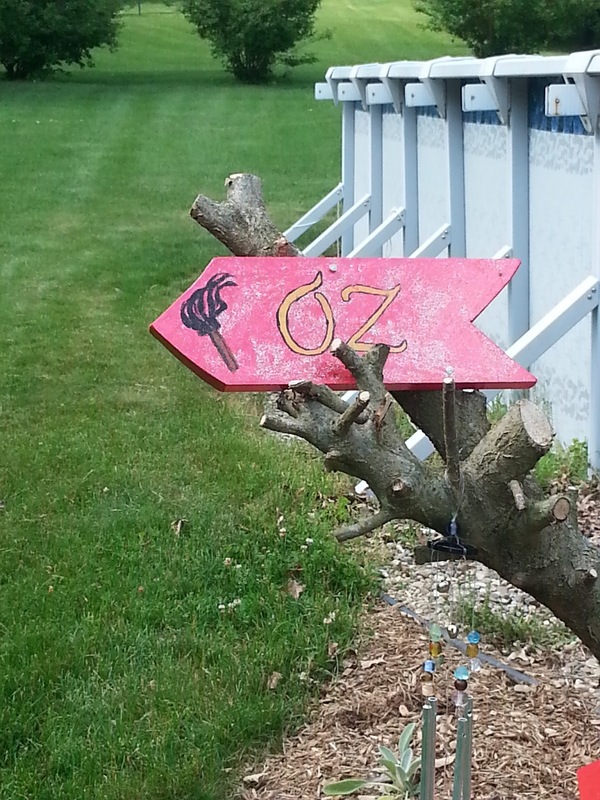 Luckily, the signs really looked great with the clear coating and it helped make the colors stand out even more than before. Finally, everything was sealed up, completely dry, and ready to go. So out I went with my power drill, a hammer, and some nails and got to work. When you work with a natural item you learn that you really need to be the one that works for that item. At first what I had planned to do with display didn't work because of a few odd knobs and gnarled knots on the trunk. 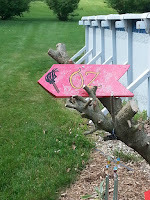 So, I just put all the signs on the grass and picked them up at random to place them where they best fit. This really added to that more cattywampus, fanciful aspect of being hung by a clever gnome caretaker...which come to think of would be a fun addition to that area as well..hmmm. Not going to lie, I knew this day was coming and soon, the calendar was more than enough evidence as I watched the days tick off one by one. The night before, I barely slept just thinking and reliving moments lost to time, but not from memory. Dreams were vivid and jarring when I did finally succumb to the sandman's call. May 19th, 2015...I wake up and of course FB immediately displays the "So and So's Bday is today! "when I go to check my phone's notifications.This date, of this year, marked the first birthday without my friend. Yes, I did cry, and of course looked through pictures and comments left for her on her page. Anger started to make its appearance with its partner grief, as one would expect while going through the cycle of loss. Needless to say, I was in a bit of a funk that morning. The idea of just staying in bed and sleeping through the day had a very appealing aspect to it, even if it wouldn't pan out in reality. Life can be crazy and coincidental like that. There I sat, quite frankly wallowing, when a reason to refocus presented itself. The request alone helped me regroup, and then the ability to brainstorm and come up with an idea helped things move along even more. Reading about her progress and fighting spirit were an inspiration as they shared her journey through the months post-diagnosis. He was, and still is, her biggest cheerleader and fan. So when he said he wanted to give her something meaningful and special, I wasn't the least bit surprised, but extremely touched and thankful to be the person he turned to to help him. His only major specifications were that he wanted the exact date and the pink ribbon somehow incorporated into the work, and that it didn't need to be encrusted with diamonds (his way of joking about cost). Immediately, I began to think of the great burlap throw pillow trend going on right now. From there, it was a matter of designing the front and back panels and adding in those little bits of embellishment that shift it from a typical throw to a unique and special gift. While I did check with him during the process with concepts and steps completed along the way, he pretty much let me have free rein. Almost everything put into making this pillow was done by hand, from the embroidery of the date, to the lace edging of the pillow and the crocheted back panel. I even hand stitched the panels together because I wanted this pillow to be extra special due to what it represents to this family. For me, it was well worth the extra time spent working on adding stitch upon stitch, both crocheted and sewn. Looking back, I don't think there could have been a better way to move on with my own personal grief. Being able to lose myself to the creativity of this project and the special purpose for its creation became a truly invaluable experience for me. This pillow's design and creation got me through that day, and honestly, it will continue to do so because it will always serve as a reminder that even though there are darker times in life, the brighter ones are still there and will outshine their counterparts if you let them. I'm lucky to be able to look at my creations and recall the wonderful stories that go into so many of them. I truly hope that the people who then own them can say the same as the years progress.